On Saturday I took a trip up to New York City for the day with 5 of my friends to celebrate our friend Heather’s birthday. Aside from the ridiculous number of hours I was awake (I had to get up at 5 am and didn’t get back home until 1:30 am the next day) it was a very fun day. We took the Megabus up and back. From Baltimore assuming you don’t hit any major traffic it takes between 3 and 3 1/2 hours. It’s one of the benefits of living in Baltimore that I can just easily pop up to NYC for a day or weekend. Usually when we go up it’s to see my sister-in-law and her family. They live on the Upper West Side so we’re usually doing kid friendly stuff up around those parts of the city or I’m seeing a Broadway show, which means it’s been a really long time since I’ve been south of Midtown, so this trip got me into some parts of the city I’ve either never been to or haven’t been to in a really long time. God bless Heather for extremely well planned out itinerary. She pretty much always knew where we going and how to get there. The planner in me very much appreciated it. I very much like having a plan, which usually means I wind up making all the plans. It was nice in this case to have a very well organized plan while getting to take a vacation from being the one doing all the work. After getting into the city our first stop was for breakfast bagels. You can’t beat a New York City bagel. Every time I eat one I am reminded how inferior the bagels in Baltimore are. I will continue to scoff at all the people who tell me it is impossible to get good pizza outside of New York though. 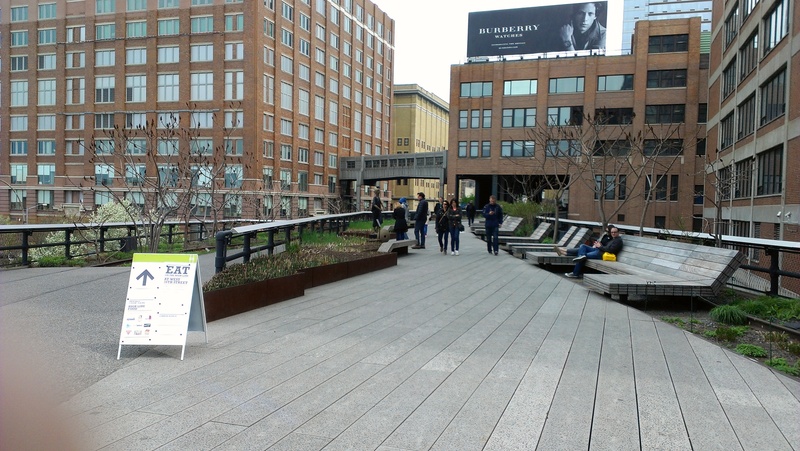 Our first real stop was the High Line, which if you are not familiar is a park built a few years ago along an old elevated railroad track. I’ve heard lots of good things about it since it opened, but have never made it down there until this trip. As advertised it was pretty cool. 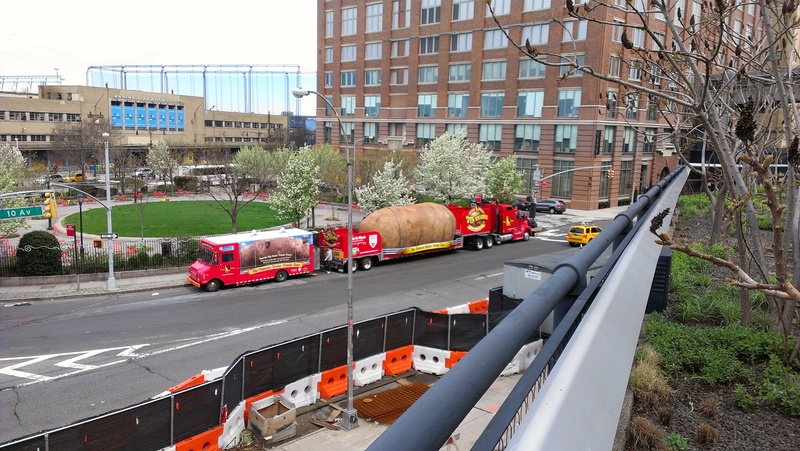 Picture of a giant potato we saw looking down from the High Line. You know just because. 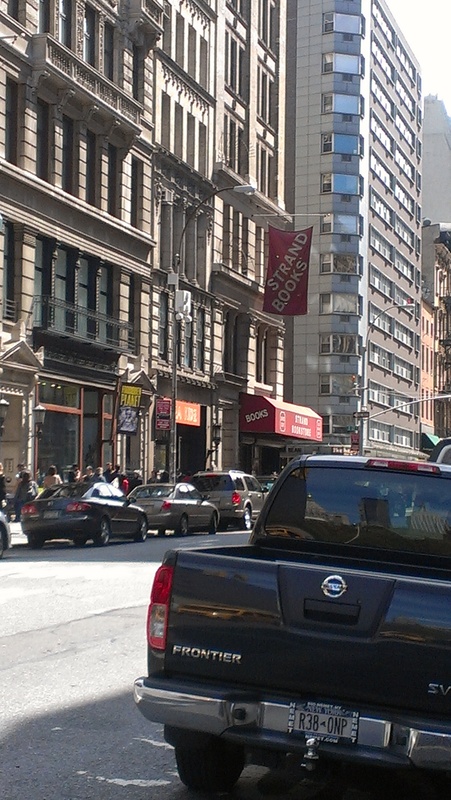 After the High Line we headed to the Garment District so my friends could look at fabric. I can barely sew on a button, but some of my friends including Heather who does professional costuming for a number of Baltimore theaters are much more excited about these things. I just sat in a chair while they went about their business. Then we headed up towards Union Square where we got some bread, cheese, and fruit from the farmers’ market there for lunch. A former roommate of my friends Heather and Julie is currently living in Manhattan so Julie arranged for her to accidentally run into us in Union Square to surprise Heather, which she did, so that was kind of fun. After hanging out in Union Square and enjoying the beautiful spring weather for awhile we headed over to The Strand to peruse the books. Hello 18 miles of books! Unfortunately I couldn’t find what I was looking for. I asked and supposedly they had it, but I looked on the shelf twice and my friend Alison lent her eyes as well and we couldn’t find it. Oh well. I’ll just get my local book store to order it for me. We did some regrouping over coffee/chai after we finished at The Strand deciding that it was too late in the day to make going to The Guggenheim, which was our original plan, worth it. Instead we decided to head up to the Upper West Side (I can’t get away from that part of the city) and grab cream puffs from Beard Papa and then hit the Natural History Museum since it’s free to get in during the last hour they are open. 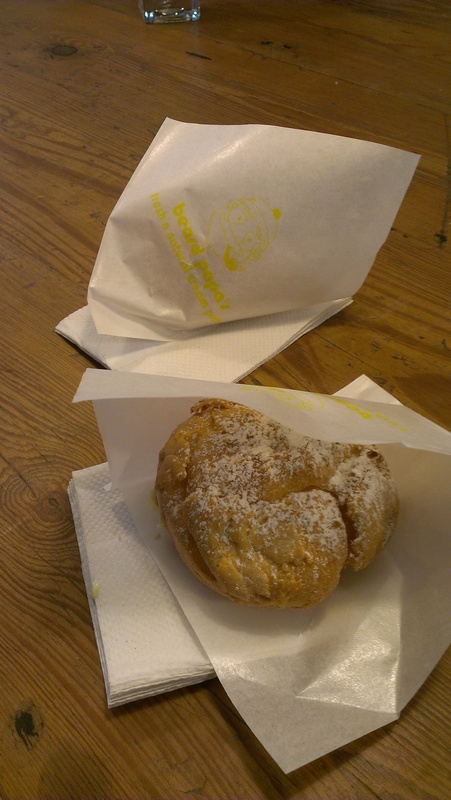 I was all for this plan as Beard Papa is delicious and I haven’t had it for a long time. My sister-in-law used to live about 10 blocks from it so my husband and I would always swing by on our way to or from their apartment. Then they moved and it was no longer convenient to just walk there, so we haven’t been in awhile. Most of the people I was with had never experienced the joys of Beard Papa, but they are now totally on board. My delicious Beard Papa cream puff. After cream puffs we spent about 40 minutes wandering around the dinosaur exhibit in the Natural History Museum before they kicked us out and we had to head to dinner anyway. Dinner was at a delicious Italian restaurant called Mercato. If you’re in Midtown and need a place to eat I would highly recommend this place and I don’t even like Italian food that much. The atmosphere was great. It was kind of rustic, and as I mentioned the food was fantastic. Although they don’t serve the food family style we essentially just ordered a bunch of stuff at random (at one point we had an fried seafood appetizer, ravioli, and a dessert at the table all at once) and shared. Everything was delicious and it was seriously the best ravioli I have ever eaten. The end of dinner was the end of our trip for the most part. After that we headed over to the bus pick up location and then made our way back to Baltimore. It was a very enjoyable day and I’m sure we’ll do it again sometime in the future. It sounds like you had a really great day trip to NYC! I wish I lived closer to the city so I could take a day trip. I’ve never had a NYC bagel but it sounds delicious. Thanks for sharing your trip!